Tom Bogaert, Emerson Lake and Palmer, screenshots from DVD Pictures at an exhibition, 1971. © ELP. Having worked as a lawyer for the United Nations High Commissioner for Refugees (UNHCR), Tom Bogaert has managed to garner a degree of access to communities throughout the Middle East that is often difficult to acquire. In his work with refugees he has witnessed first-hand the geo-politics of the region and since 2004, has channelled that knowledge into his practice as an artist. Speaking here to Anthony Downey, he explores the research processes that lead up to producing work and the sound project he has developed exclusively for Ibraaz. The latter involves sounds from cities in countries as diverse as Jordan, Iraq, Palestine, Lebanon, and Syria, and Ibraaz is pleased to showcase it here. Elsewhere in this conversation, Bogaert explores the backdrop to his multi-media project Syria, which was produced this year; his ongoing ideas for a mausoleum for Bashar Al Assad; the overt aestheticisation of warfare and combat in the region; and the issue of whose interests are served by seemingly innocuous terms such as ‘Facebook Revolution’ and ‘walking through walls’, the latter phrase having been deployed by the Israeli Defence Force (IDF) in their strategising of combat situations in cities such as Nablus. Anthony Downey: I want to begin here with your project for Ibraaz. As I understand it, we have a number of sound pieces from you, each recorded in different places, one in Syria, one in Jordan, one in Palestine, in Lebanon and Iraq. One of them was recorded in 1974, and that’s by the so-called ‘art rock’ band Emerson, Lake and Palmer – could you talk a little bit about how these works came about, and the background to what we are listening to? 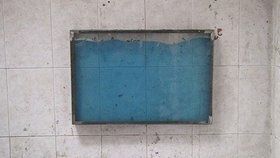 Tom Bogaert: I had been working with radioCona, an artist’s collective based in Slovenia, in Ljubljana. We had this project that was regularly broadcast via their own radio station. I’d always worked with sound, but it was never really separate, it was always an integral part of the artworks – so this was a new thing for me. When Ibraaz approached me for a web project, it was the first thing I thought of, as online works are usually image and text-based, or moving images. I was thinking about radioCona and trying to focus on sound, and that’s how I came up with something purely sound-based. As I have been working in the Middle East for three years – in Jordan, Palestine, Syria, and Lebanon – I went back to find some interesting sounds. And that is how we came to have five separate sound piece projects for Ibraaz. AD: How did you come to work in such different cities throughout the Middle East? TB: When I introduce myself, I usually say I’m an ‘accidental Orientalist’. I ended up in the Orient by accident when I followed my wife to Amman. We were based in New York before that. Before becoming an artist in 2004, I worked as a refugee worker – I’m a lawyer by training – under the auspices of the United Nations High Commissioner for Refugees (UNHCR). So in Amman, I met a number of people from the organisation Makan, which had been set up in 2003, and they invited me to do a residency there. They introduced me to people in Aleppo and Damascus, and from one project and residency it was like an organic flow into other projects: first Jordan, then Syria, then Palestine, then Lebanon and Iraq. AD: Could we talk a little bit about the specific sounds themselves – one of the sounds is of a plane crashing into a building. 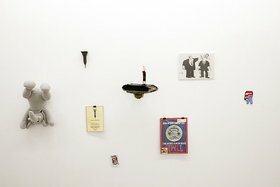 Tom Bogaert, Empire state-building – failed attempts at state-building by imperialistic outsiders, 2012, installation view Al Hoash Gallery, Jerusalem. © Al Hoash Gallery. TB: Yes, it is a recording of a plane that flew into the Empire State Building in 1945, which has to be seen in context of my Iraqi project. Basically, the title of that project was Empire state-building. In 2008, I wrote a short essay when I was at New York University (NYU) and studying nation-building in post-conflict situations, in places such as East Timor, Haiti, and Kosovo. I was looking for a good title and I came up with ‘Empire state-building’, which references state-building and nation-building by imperialistic outsiders. I used the title and it dealt with failed attempts at state-building in Iraq. Empire state-building deals with top-down approaches to trying to rebuild a state after a conflict situation as opposed to grassroots initiatives, where everything comes from the people. So that was a text-based project, initially, and I later linked it to the building of the actual Empire State Building in Manhattan, which was designed top-down. Basically, Empire state-building, as a project, deals with upside-downness, and in turning things upside down as a technique and as a practice. A lot of artists have used this technique of turning things upside down. It sometimes seems like an easy solution – like with Allora and Calzadilla’s piece Gloria for the American pavilion at the 54th Venice Biennale, where they turned a tank upside down outside of the pavilion. Time magazine has also used it on its covers, some cartoonists use it – Ali Ferzat, for example. 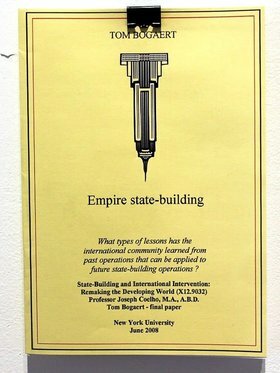 So it started with a more or less very dry academic text that I expanded into something else – using the title Empire state-building – and in relation to the context of modern-day Iraq. Of the five projects I have submitted to Ibraaz, however, only one did not have sound, the one based on Iraq, so I basically went on the Internet and started looking for sounds dealing with the Empire State Building. One of the sounds you find concerns the events around a US Army B-25 bomber that crashed into the Empire State Building on the 28th of July, 1945, leaving 14 people dead. The sound has a very old-fashioned radio feel to it. This is different from the other sound recordings in these projects in that it was not part of the project before you asked me to do something online. The other four fragments of sound existed in other projects. AD: This brings us to the project And did those feet for Al Hoash gallery in Jerusalem, which effectively used a very distinct recording by Emerson, Lake and Palmer titled Jerusalem, from 1974. Could you talk a little bit about that project, because it seems it’s very much oriented towards sound but there’s also a very formal aesthetic being engaged with here. 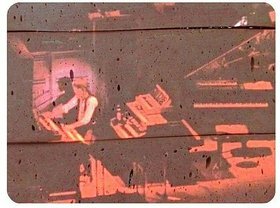 Tom Bogaert, Emerson Lake & Palmer performing ‘Jerusalem’ in 1974, 35mm slide projection on processed ‘Siniora Al Quds’ meat. Courtesy of the artist. TB: Absolutely. But first maybe this: the way I work as an artist, my process, is somewhat of an extension of how I worked before. I originally started out writing reports, I participated in fact-finding missions and so on for the United Nations, so I have always liked to work in the context of frameworks and deadlines. When I go somewhere new like Jerusalem, and as an artist rather than as a UN employee, I want to do something new and observe as much as possible. I was not asked by Al Hoash gallery to make a new piece for Jerusalem but it’s such an intense place that I really wanted to do something with it. Different elements come together in this project; one of them has to do with Jordan and the so-called ‘Jordan option’. There is a theory, outlined as a proposition by the Israelis, in which it is suggested that if the Palestinians are not happy living in the West Bank or Jerusalem, they should just go to Jordan. More than 50 percent of Jordan’s population is Palestinian in origin, and therefore – Israel argues – a Palestinian state already exists in neighbouring Jordan. At the time, I also found this beautiful can of processed meat called Siniora Al Quds, which I did some research into. Although this processed meat is branded as if it is from Jerusalem (Al Quds), it’s largely produced in Jordan. So that was another element in this project. And then there is this song, Jerusalem, which is played at rugby games as an emblem of the United Kingdom. I also heard it being played at the wedding of Prince William and Kate Middleton and I wanted to do something with it. When I stumbled upon the version of Jerusalem by Emerson, Lake and Palmer, which initially was not really my kind of music, it brought home to me that so many people make claims to the city and its symbols and what that says about the whole situation that exists between Palestine and Israel over Jerusalem. So that’s why I wanted to work with the sound recording. I projected the band performing this song live onto slices of Siniora Al Quds processed meat and also found the original vinyl record of the song. That’s how I work; it’s very down to earth. I go to a new place, I talk to a lot of people, I read a lot, I research the geo-politics of an area, and see what comes of it in my practice. Tom Bogaert, And Did Those Feet, from the seriesEmerson, Lake & Palmer performing ‘Jerusalem’ in 1974, 2012, 35mm slide projection on processed ‘Siniora Al Quds’ meat, installation view Al Hoash gallery, Jerusalem. © Al Hoash Gallery. AD: I didn’t get the connection between the cold cuts of meat and the projection of the performance of Emerson, Lake and Palmer, but it seems to me that the notion of displacement is also integral to this work, because the original idea behind And did those feet in ancient time, the poem written by William Blake in the beginning of the 19th century and which acts as the basis of Jerusalem, was an apocryphal story about Jesus apparently journeying to Glastonbury, and Blake picks up on this ideal of a displaced kind of heaven on Earth, a Jerusalem in England so to speak. TB: Yes, a Utopia, a new kind of Jerusalem. During Jesus’ lost years, apparently, and according to the myth, he came to England to create a brave new world and the poem deals with that story, a version of Jerusalem as a place of peace and love and eternal happiness, which, as we all know, the real Jerusalem is not. AD: And yet, people continue to project an idealism onto the actual site of Jerusalem itself. TB: Yes, seemingly without really knowing the city. But I don’t think that if you sing this song at rugby games you really think about Jerusalem, about the old city, East Jerusalem and the Palestinians and the Israelis. This was very much part of what intrigued me: the abstract ideal of Jerusalem. AD: It seems as well that this is not only about displacement but also about the disjunction inherent within the idealisation of Jerusalem itself. TB: Yes, I was really surprised to see this disconnect between that idealisation and the reality we are confronted with when there. AD: It seems that in this and other works you find an aesthetic way of not so much resolving various areas of research but interrogating certain presuppositions. I found this particularly in your installation work Syria, 2012, which is intriguing and looks formally quite straightforward but turns out to be quite complex. There are a number of allusions in it, but also illusions, involving the question of how we look at things. 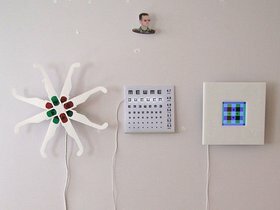 We have a very schematic installation, including an eye chart, a small picture of Bashar Al Assad, and some coloured glasses. Could you talk a little bit about that work, because again I think it’s key to the process you work by, which is through research to begin with but also by creating allusions between apparently disparate events. Tom Bogaert, Syria, 2012, installation view, Al Hoash Gallery. © Al Hoash Gallery. TB: After Jordan, I went to Syria. I had a couple of contacts in Damascus, and in the rest of Syria. In Aleppo, I met with Issa Touma, who is running a small art gallery called Le Pont gallery and we started talking. I think it’s relevant to say that this was all pre-revolution because, as I said, I didn’t come to the Middle East to be an activist. I decided, having left the refugee world, that my days of activism were over. So I went there as an observer and I found out about Bashar Al Assad studying to become an eye doctor in the UK before he became president of Syria. When his brother died in a car accident, he was called back to take care of the family business; he had a crash course in the military and when his father died, he became President. I wanted to find a relevant way of commenting on things and the thing that struck me was that Assad was supposed to become an eye doctor. His wife was very supportive of that and I wonder now, does he still dream of that time or think about it? The eye chart in the project Syriabecame the starting point for this line of thinking. I think there are different eye test chart systems, but this is the one they use in Syria, left to right and then down up, that’s how they test your eyesight. And I linked it with their foreign policy: it’s a secular Ba’athist regime, so that’s the vertical dimension going down and, at the same time, they support very extremist religious groups, so that’s the vertical dimension going up. His father flirted with Communism, which is associated with the left, and so the whole rotating eye chart became a symbol for their foreign and domestic policy. Does Bashar still dream about tumbling Eye Doctor E charts and the course for Syria they might chart: left, right, up or down? And then based on the specific graphics of this eye chart, I started making objects. I’m happy in my studio, I do a lot of work behind the computer, research and reaching out and talking to people, but at the same time I want something tangible to show for it, something people can look at. So, working with people in Amman and in Syria, we started building water tanks, which you see all over Syria, in the shape of various symbols. Usually, when Presidents get a little older they start thinking about how they will be remembered, what their mausoleum will look like. Mitterrand did this in in France, and Ataturk had a huge mausoleum built for his remains. Since Assad trained as an eye doctor, he might think about a mausoleum shape related to the eye chart. When he came to power in 2000, there was this talk about the Damascus Spring but it didn’t last very long. He did introduce Syria to the Internet, however, so I thought: let’s translate this into something virtual and online and we started building Mausoleum for Bashar Al Assad in Minecraft, the latter being a building game that is quite popular with gamers nowadays. My son actually helped me with building it, experimenting with how we can create a virtual sculpture. For me, as a commentator, it was very interesting to see that I could present this project in Aleppo in 2010 without too much difficulty. We organised an artist’s talk, where we were able to discuss a mausoleum and we could talk about the fact that he was an eye doctor, about his fears and the fact that he might wake up in the morning in a beautiful house with a beautiful wife and ask himself, well, how did I get here? What have we done? That was all pre-revolution, and that was all possible in Syria – there was a small window of opportunity in hindsight. We obviously could never do that today in Syria. AD: There’re quite a number of levels of irony, of course, that were not apparent at the time of making the work but now obviously have become apparent: the idea of seeing and not seeing, of looking at the world through rose-tinted glasses, and so on. TB: Yes, that is certainly the case. 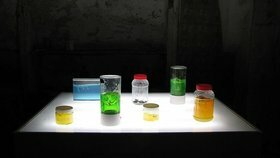 Tom Bogaert, Ant Farm Nablus, ant farm gel experiments on light box, inspired by Eyal Weizman’s text Walking Through Walls, 2011. © Birzeit University – ArtSchool Palestine. AD: Another element in your practice that interests me is the way it engages with immediate environments and its site specificity. I think it’s very important that we don’t over-read your work in terms of politics, but I was interested in the the geo-politics of a work such as Ant Farm Nablus (2011), a project that references the Israeli Defence Force’s (IDF) policy of ‘walking through walls’, which was developed in 2002 in Nablus. From what I understand this involved the IDF in a practice that literally deconstructed the urban fabric of Nablus – blasting holes in living room walls, stairwells, roofs – so as to allow the free movement of soldiers through that space. To the extent that this was a kind of site-specific intervention in its own right, could you talk a little bit about how Ant Farm Nablus addressed this issue of space and site-specificity? Tom Bogaert, Ant Farm Nablus, site specific intervention in the old city of Nablus, 2011. © Birzeit University – ArtSchool Palestine. 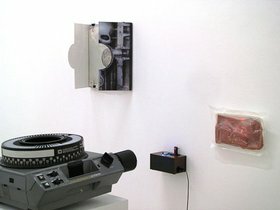 TB: As with the processed meat can, I had a text by the theorist Eyal Weizman lying around my studio. When this opportunity came up to do a site-specific work in residency with ArtSchool Palestine and Birzeit University, I started brainstorming, thinking what am I going to do there? It was then that Weizman’s text somehow resurfaced and I reread it in the context of a possible project in Nablus. Weizman’s theory with regards to looking at space as a ‘fluid medium’, and the way in which the Israeli Defence Force treats specific spaces as virtual, as if playing a computer game, affords them a very clean and very academic way of dealing with resistance. Now, I have spent some time in Nablus and spoken to a lot of people at the time of that ‘walking through walls’ moment and it was horrible. It’s the same thing now in Syria – it’s not a ‘Facebook revolution’ or a ‘Twitter revolution’, it’s a bloody civil war. I was talking to my neighbours, looking for traces of these targeted mini-explosions that were supposed to be about precision bombing. I say I was looking for traces of it because if something like this happens in your house, you fix it as soon as possible, so it was very hard to find such traces. I found a couple of houses and I tried to work with them as a site-specific starting point. The neighbours came initially and thought I was a settler, and they wanted to know what I was doing there, and my Arabic is very basic so there was plenty of room for confusion and suspicion. But after two or three days, and with the help of an interpreter, we talked to each other and had coffee and discussed this idea of so-called ‘clean and aesthetic’ warfare and what was actually happening on the ground. For people living in Nablus, it was a nightmare: they lost their sons and daughters, family members. When you call it ‘walking through walls’, to use the IDF’s phrase, and employ ideas such as ‘fluid medium’, then you also need to ask: whose ends are being served here? When you talk about a ‘Facebook revolution’, as Ibraaz has noted in its new platform, you equally need to enquire into whose ends are being served? Maybe Mark Zuckerberg is happy with this, just as the IDF is happy with phrases such as ‘inverse geometry’ and ‘fluid medium’. Tom Bogaert, Walking Through Walls revisited, site specific intervention, old city of Nablus, 2011. © Birzeit University – ArtSchool Palestine. AD: Effectively, when we’re looking at this policy of ‘walking through walls’, this visualisation of space as fluid and permeable and controllable, we are really looking at an aestheticisation of space – the urban fabric of Nablus, for example – that works as an anaesthetic inasmuch as it distances the observer from the tragedy unfolding within those buildings. TB: Yes, it creates a distance between the beach in Tel Aviv and the dark world of resistance in Nablus, and it’s something you can turn into a computer game by proxy that allows you even further distance. AD: The effect of distanciation in war and conflict is interesting because it not only aestheticises events but the aesthetic itself can actually be a barrier to understanding. And it seems to me, with Ant Farm Nablus, there is a sense in which you are working with the process of aestheticisation and how it creates distance. TB: That’s exactly so, but I’m also aestheticising war in Nablus in this work because it looks very photogenic, but the reality is there too. The images that you see are of a hole in a living room, the result of a targeted explosion according to what the neighbours told me. The residents had taken out their furniture and were waiting for someone to fix it, so it was clean when I found it and I wanted to recreate the moment this actually happened. 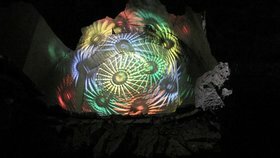 AD: You also projected some imagery into the hole. TB: Yes, it’s a very cheap disco light I bought from the local market in Nablus, it’s one of those Chinese lava lamp-based psychedelic gadgets. And I wanted to bring chaos back into that room because it looks very serene and photogenic. I added smoke and sound and I wanted to make it look fresh, as if the military had entered and just left the room. AD: And therein lies another huge danger – if you take any event in the Middle East, be it post-Civil War in Beirut, be it current events in Cairo, there is always the danger that aestheticisation, the visualisation of conflict, produces an anaesthetic whereby we simply feel we have access to the event by virtue of it being visualised. But in fact we are being further distanced from the event, if not absolved from any involvement, direct or indirect, in it. Tom Bogaert, State Building and international intervention, NYU paper, 2008. © Tom Bogaert. TB: Yes, I would agree with that. I also think there might be a link with Empire state-building here. In my essay I wrote that in the early part of the twentieth century, when the British couldn’t handle the situation in Iraq any more, Hakumat al tayarra (government by aircraft) was introduced as deus ex machina in the Iraq tragedy. Here again was this top-down approach, literally, and it created this safe distance between the world up above and the reality below. It’s similar to the drones today being used in Pakistan and Afghanistan; it deals more and more with creating this perception that it’s clean and safe, and that like surgeons we can intervene in matters without any repercussions and without getting our hands dirty. TB: Or even by remote control. By proxy you have somebody else doing it for you; here you would have a machine doing it for you. I was talking to this old lady in Nablus – I have a lot of anecdotes and usually I don’t use them in print – but there is a link here with the title And did those feet, because for me it was very important to do this project about Palestine in Palestine, I had to be there. You cannot make these works by proxy. It’s a very simple prerequisite from my side, I want to go there and I want to spend as much time as I can in these places. AD: How did the people who lived in Nablus, in the buildings you used, react to this? Because it’s obviously quite a serious re-intervention into a space that’s already been intervened into. TB: First of all, I was there within a context, with ArtSchool Palestine and Birzeit University, so there was a team there to help me explain things to the neighbourhood. It was quite a big project. On the opening day, we had 800 people coming to the opening event, which for Nablus is a lot of people – all the local politicians and local artists came too. In the beginning, nobody trusted me and there was suspicion, it brought back a lot of memories, but this intervention, and within this narrative culture, prompted people to open up. They would take time to sit down and talk about the events and their reactions to the original events and my subsequent intervention. But I didn’t use the interviews in my project. It was just as a way to better understand people, and it’s very enjoyable to talk to people – how they deal with reality, with occupation, with war and Intifada. 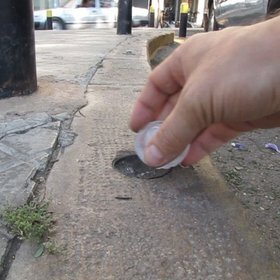 AD: Bearing that in mind and your talking about how interventions reference a broader socio-political context, I was interested in the work you produced in Beirut in 2011 called Pavement Popsicles. The one thing I note about a lot of your interventions is that they can be easily retrieved, they’re impermanent and Pavement Popsicles is precisely that sort of intervention: it’s there for a certain amount of time, it makes a commentary on a particular moment, and then it’s gone. Tom Bogaert, Pavement Popsicles documentation of performance, video still, 2011. © Siska. TB: Gone in 20 minutes, in this case, especially in a Beiruti summer. Producing this work in Beirut was special for me because the city has a very specific status in the Middle Eastern art world as you know. It’s very competitive and people will be critical and you have to come up with something really good. So I just went and lived in the city for a while and tried to add some value to the city. I wanted to do something with ice. I went skiing in Lebanon and this was completely incompatible with images I had of Lebanon, images of the Civil War and conflict, so the idea of using ice was appealing. I met some local video artists and they helped me out, as I was interested in recreating the original lenses that are used to demarcate curbs and verges along the roads of the city – the type that reflect back light to let you know where you are, I think they are also called ‘cat’s eyes’ and look like indented pavement markers. A considerable number of these have broken or been removed over the years and I wanted to find the original lenses from the municipality. I spent days inside this red tape environment where people didn’t trust me because they thought I was complaining about the fact that these lenses were broken. But that’s what I enjoy doing: I had a mission, I had to find an original lens to make a negative – a mould – which I could then use to make a version in ice. I finally found one after five days and so was able to make these ice versions of these missing lenses and place them in the gaps where the originals had once been. I was approached by this environmental NGO when I was doing this and, as they were concerned with the fact that Beirut has so little green space, asked if I could plant trees in the gaps created by these missing lenses. But I didn’t want to get involved in that. Then there was also the fact that Chinese lenses can be bought online for ten cents, while the ones they have in Beirut were made in France for historical reasons I guess and cost two Euros a piece. Who is profiting from these 100,000 lenses that are used a year? Somebody else, a local journalist, could perhaps look into that. AD: It seems that your work as a practice engages with ideas of site-specificity in a particular moment in time and yet there’s a transience to what you present or produce that would suggest that if you were to leave a mark after that moment would defeat the purpose – to plant trees for example into the gaps where these lenses once were would be counterproductive, it wouldn’t draw attention to the absence or the ambiguity or the nuance of that particular space. TB: Yes, that’s what I told them. I’m not here to leave a permanent mark on your city, it has to come from you, don’t wait for me to come up with a framework. AD: It seems as in Nablus that the marks are already there and yet they are not necessarily noted and suddenly just noticing them, with an action or an intervention, re-articulates their importance. TB: Yes, I hope that is the case in my work in general. Before dedicating his life to art, Belgian artist Tom Bogaert documented genocide and human rights abuses in Africa, Europe and Asia. He worked as a lawyer for Amnesty International and the UN refugee agency. The artist does not see his artwork as an extension of his refugee work, although it does directly confront the intersection of human rights, entertainment and propaganda. Tom Bogaert stopped practicing law in 2004 and participated in the Elizabeth Foundation Studio Center in New York City. He had his first solo exhibition in New York in 2008 with Jack the Pelican Presents gallery and has exhibited work in Europe, the Middle East and the US. In January 2010, Bogaert began working on ‘Impression, proche orient’ (IPO), an art project referencing issues relevant to the contemporary Near East society including politics, artistic identity and the new Arabs. His recent solo exhibition And Did Those Feet at Al Hoash Gallery in East Jerusalem included works from IPO in Jordan, Palestine, Lebanon, Iraq, Egypt and Syria. Bogaert, Tom. “An Accidental Orientalist: Tom Bogaert in Conversation with Anthony Downey.” Interview by Anthony Downey. Ibraaz. Ibraaz, 27 Sept. 2012.